In November 2005, 19 Americans and 21 Nigerians came together in Oporoza, a village in the riverine region of the Niger Delta. We worked hard, sweated much, danced often. We laughed in the face of many challenges and were moved to tears by the conditions in this region. We made deep connections and learned an enormous amount-about ourselves, each other, our village hosts and the complex fabric of Nigerian life. The GCJ Nigeria 2005 project was a regional library, the first public library in the entire riverine region. 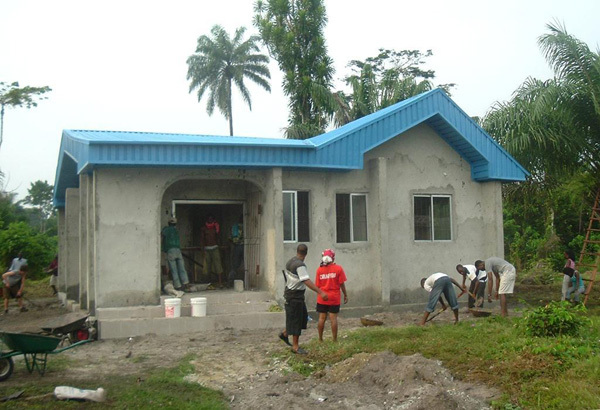 The Niger Delta Friendship library was successfully completed and commissioned on November 28. The doors are open and more than 1300 books-most of them brought by GCJ delegates in boxes and suitcases-are now available to the community. Christi’s article: on her perspective as a librarian. Article in the Boeing Corporate Philanthropy Report (page 30). Boeing was a significant sponsor of the Journey. Making Communication Work: a report by Sylvester Aigbe to the Computers in Agriculture and Natural Resources, 4th World Congress Conference. (report on our first few days) Global Citizen Journey Executive Director, Mary Ella Keblusek lit up the crowd with a brief rendition of “The Bluest Skies are In Seattle”. This, plus the group’s choir of the National Anthem were all part of a joint ceremony with the Nigerian American Chamber of Commerce. US citizens were spared this moment of embarrassment. For most folks, we made the long flight to Lagos with a spur of excitement. The long flight from Europe allowed many to catch up on sleep or take pictures of the vast Sahara. It took about two hours to pass through customs and receive baggage, then about an hours drive to the hotel: a 2.5 star with a local feel. Grilled ram (actually beef) with onions and one too many beers before bed at 1 am. Many woke up at 5 the next morning with light and the neighborhood’s Imam call to prayer. Breakfast; fish stew with boiled yam with an exotic flare to our western palates, supplemented by tea, oatmeal, and juice. Afterwards, we piled into two minivans an hour and a half drive to the Chevron Nigeria Ltd. headquarters. The air is heavy with exhaust, but not nearly as much diesel as others remember in Jakarta and distant metropolises. Roads are jammed with 15 to 20 trafficyear old European cars, some Japanese, with only a select few American SUVs. The motorcycles. The bare feet and the transportation. And the Public Transit consists of yellow vans, bigger than minis, but not much, painted yellow with passengers standing outside the sliding door traveling up to 40 miles an hour on narrow, tight lanes. Which buses go where? No one knows from our frame of perspective. We met with senior managers at Chevron who did a number with words outlining the tensions which occurred 2 years ago. They modeled a new giving plan that invites more participation and involvement among local leaders in deciding which projects receive funding. The folks were Didji Hastrup and Simon Winchester who, with their thoughtful and articulate manners, showed a clear interest in GCJ’s journey and its purpose. Simon was certainly thought thru a lot of the corporation’s involvement, and other whom are providing assistance. Our minds exhausted, and then off for a picnic lunch on the Nigerian beach off Victoria Island in Lagos where a big bargaining brouhaha over the cost of tents and tables commenced between Joel and the proper stakeholders. Chicken and rice spilled onto our laps amidst the notes of a local guitar player singing Marley and his ubiquitous melodies, but each was able to down their bottles of water and use the extra for other purposes. Off to the National Museum which had a small, but worthwhile, collection of tribal artifacts, staffs, spears, dance masquerades, swords, armor, and carvings. Too many tribes to keep track of. Too many complexities we slowly learn. It was here that the Chamber hosted us for a dance and music performance which was stunning. During intermission, a Nigerian who does excellent trumpet-mimicry asked Susan and Mary Ella to come up to do Oshe Babalua. He asked for a Seattle song, one local to us, which resulted in The Bluest Skies. Running out of time more later! And know you are all in our thoughts as we make this pilgrimage of the heart. Thank you for your unending support! There are reminders that folks haven’t forgotten how tense things were previously-and still remain so. Soldiers stand on the roadways ready to flag cars for papers and as white worms among the crowds, we are strongly encouraged to return home before dark.